Electric car maker Tesla Motors (s TSLA) delivered Wednesday on its promise that it would turn its first profit ever in the first quarter of 2013 and also generated a record amount of revenue, giving it the confidence to increase the guidance for its annual Model S sales by 1,000 cars. At the same time, Tesla admitted that $68 million, or 12 percent, of its revenue for the quarter came from selling ZEV credits, something which has been riling other auto makers. For the quarter, Tesla generated $11.25 million in income, compared to a net loss of $89.87 million for the year for the first quarter of 2012. On a non-GAAP basis Tesla said net income for the quarter was $15.42 million. Ten-year-old Tesla also set a revenue record for the quarter, which isn’t surprising given this was the first quarter where it had a full three months of full-scale Model S production. Tesla generated $561.8 million in revenue for the quarter, compared with revenue of just $30.17 million for the first quarter of 2012. There’s been a lot of talk about how much of Tesla’s revenue and profit for this quarter would come from the sales of zero emission vehicle (ZEV) credits to automakers. The LA Times reported that Tesla can make $35,000 per Model S car sold in ZEV credits, which could generate up to $250 million for Tesla this year. Tesla addressed that point in its shareholder letter and said that Tesla generated $68 million from ZEV credits for the quarter, or 12 percent of revenues. If Tesla generated that amount for each quarter it could bring in $272 million from ZEV credits for the year. However, Tesla said that it expects its use of ZEV credits to decline because the ZEV credits only apply to a sixth of international sales, compared to half of U.S. sales. Tesla is so confident of its manufacturing capabilities this quarter that it raised its guidance for the year by 1,000 cars. Tesla now says it expects to ship 21,000 Model S cars, instead of 20,000. Tesla says it is receiving orders of over 20,000 cars per year. Tesla’s margins are also improving significantly, and the company has a target of 25 percent gross margin by the end of 2013. 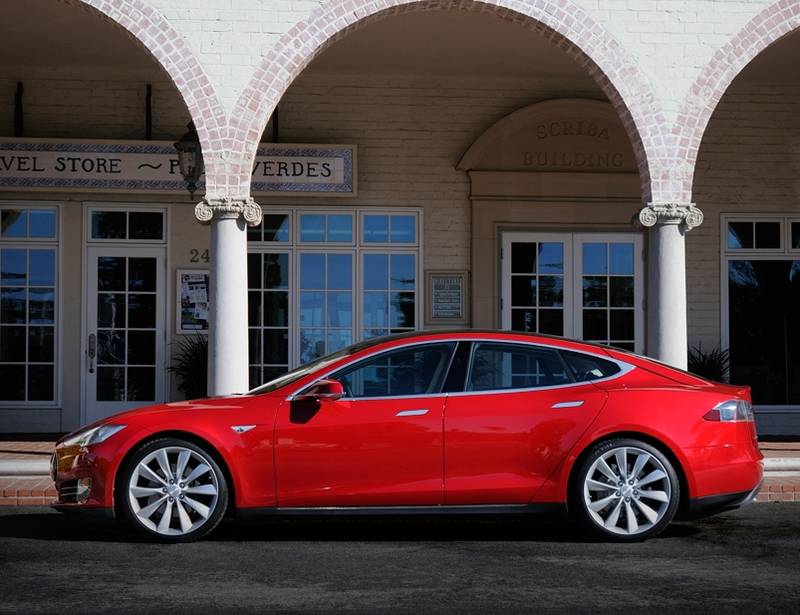 This quarter Tesla delivered 17 percent gross margin, up from 8 percent in the last quarter of 2012. That 25 percent margin is without ZEV credit, Tesla noted. Tesla shares jumped almost 30 percent in after hours trading on Wednesday to over $70 per share. On ZEV credits: Musk said he expects a decline of ZEV credits in Q2, and Q3 and potentially no ZEV credits in Q4. Tesla plans to spend $200 million in capital expenses in 2013, and that includes things like Model S factory tooling, new product development, and building out the Super Charger Network. Musk said Tesla has no plans right now to raise more funding. Tesla has a seen a meaningful improvement on demand because of the financing product. 10,000 Model S sales are expected from Europe, 5,000 are expected in Asia. “China is a wild card,” said Musk. Up until the second quarter of 2013, all of Model S sales have been in the U.S.
Tesla’s top focus this year is on improving the efficiency of production of the Model S.
Updated at 3:10PM PST, with information from Tesla’s call and the stock price. EV’s are such a better option for the world. In time they will be cheap – like the difference and quality between the first cell phones and todays smart phones. Well done Tesla. Great to see so many of these energy efficient and gorgeous cars on the roads.